For the 7th time in new york - designboom will host a group exhibition of 40 international design professionals from around the world as part of the cultural program of the ICFF, the international furniture fair in new york, held from may 14th - 17th, 2011.
design fairs are a fantastic occasion to reach like-minded people (curators, press, general public) as well as industry professionals. they are all in love with design and want to know the stories behind the 'products', they like to shop and the designboom mart is the place to do it. 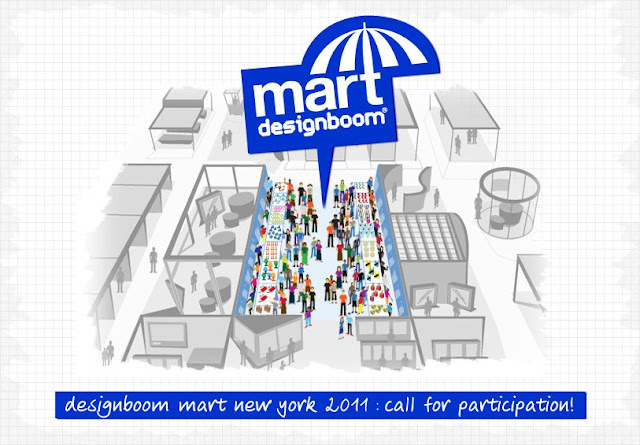 the designboom mart is widely recognized as the ORIGINAL, the first ever design bazaar. in early 2005 designboom created a completely new formula of exhibition and since then we have organized over 20 international marts worldwide, that combine high-profile design with a popular street market setting, making up the cultural program of trade fairs. In designboom's unique and world famous market exhibitions, visitors are not only able to meet the young avant-garde designers and become familiar with their work but also buy self-produced or limited edition pieces directly from the designers. profits through sales can be used towards partially covering any travel costs. Over the intense days of exhibiting and socializing, the designers have the chance to discuss their work with other like-minded professionals, customers, manufacturers, distributors, press and museum curators verifying their designs and their packaging credentials. this unique formula now sees its 23rd edition, since our very first mart in new york in 2005.